Part of the NFL elite, the Pittsburgh Steelers are one of the most successful and popular franchises in the league. With six Super Bowl wins and many top players in their history, collectors have a lot of appealing choices when it comes to Pittsburgh Steelers rookie cards. The guide below offers a look at the top modern and vintage Pittsburgh Steelers rookie cards of all-time. Given the importance of condition in relation to card values, many of the cards shown can have considerable differences in value based on grade. This can be especially apparent for high-grade vintage cards. 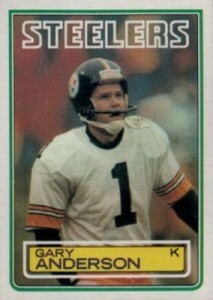 The following list counts down the top overall vintage rookie cards for the Pittsburg Steelers. Fans and collectors will find some of the top names from the team's history, including many Hall of Fame players and all-time greats. While the actual rank is largely based on card values, when values were close, historical relevance was taken into account. The vintage list is limited to cards before 1980. Collectors looking for more current rookie options should check out the tab for the top modern Pittsburgh Steelers rookie cards. 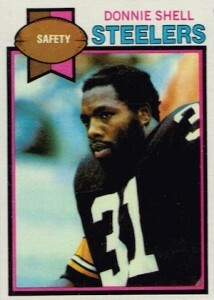 An undrafted safety that spent his entire career with Pittsburgh, Donnie Shell went to five Pro Bowls and won four Super Bowl title with the Steelers. His rookie card in 1979 Topps is a great budget option for collectors. 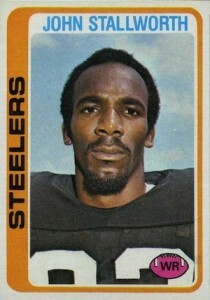 One of the best wide receivers in the team's history and a member of the Pro Football Hall of Fame, John Stallworth was a three-time Pro Bowl selection and part of four Super Bowl wins in Pittsburgh. Despite this, John Stallworth's rookie card in 1978 Topps can be found for just a few dollars. 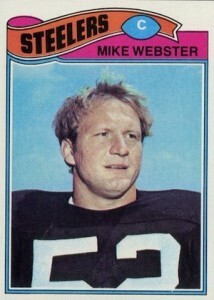 Mike Webster is widely considered to be one of the best centers in NFL history and is an all-time great for the Steelers. Webster was a nine-time Pro Bowl selection and four-time Super Bowl champion in Pittsburgh. Collectors can find the rookie card for the Hall of Fame player in 1977 Topps. A Vietnam veteran that was wounded by enemy fire before his pro career began, Rocky Bleier remains a favorite of those in Steeler Nation. The scrappy running back was a nice compliment to Franco Harris during Pittsburgh's dominance in the 1970s and his 1975 Topps rookie is a popular option. 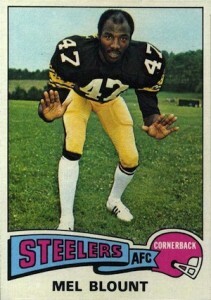 L. C. Greenwood was part of the famed "Steel Curtain" defensive line on the 1970s Steelers. 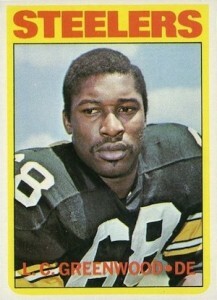 He went to six Pro Bowls during his career and collectors can find his rookie in 1972 Topps. Greenwood also has a "Pro Action" subset card in the same product. 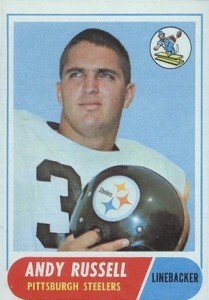 One of many great linebackers in the history of the franchise, Andy Russell was a seven-time Pro Bowl selection for the Steelers. His rookie card in 1968 Topps won't set you back too much. Touted by many as one of the best cornerbacks in league history, Mel Blount was a physical force for the Steelers in the 1970s. He was a five-time Pro Bowl selection and was inducted into the Hall of Fame. 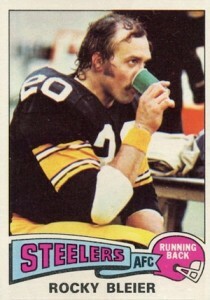 Blount's 1975 Topps rookie card marked the start of his best seasons with the Pittsburgh Steelers. An elite outside linebacker for the Steelers, Jack Ham terrorized opposing offenses for many years and totaled eight trips to the Pro Bowl. His 1973 Topps rookie card is another reasonable HOF option. One of the most popular Steelers of all-time, Lynn Swann was a Hall of Fame receiver for Pittsburgh during their glory years. 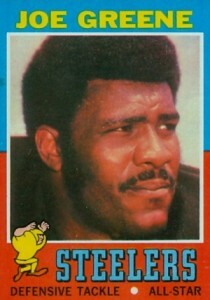 Swann was the Super Bowl X MVP and also selected to three Pro Bowls during his career. In addition to his official rookie card, collectors can also find a "1974 Highlights" subset card in 1975 Topps. 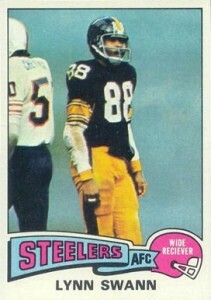 The primary rookie card features an error as "receiver" is spelled incorrectly on the front. 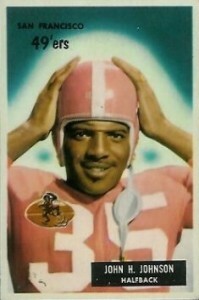 Swann's rookie card marks the points where values start to pick up. The main running threat for the Steelers during their Super Bowl run in the 1970s, Franco Harris was named to nine consecutive Pro Bowls and was the Super Bowl IX MVP. Harris' most memorable moment is known to many as "The Immaculate Reception" and involved a last-second touchdown catch to win a 1972 playoff game. 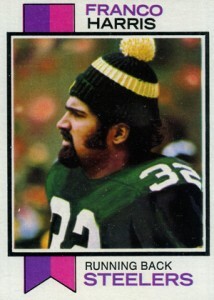 His 1973 Topps rookie holds the distinction of being one of the few Hall of Fame rookie cards to showcase a beanie hat. The other half of the dynamic Jack linebacking corp in the 1970s, Jack Lambert was one of the most intimating figures on the celebrated Steelers defense. He was named to the Pro Bowl nine straight times and inducted into the Hall of Fame. 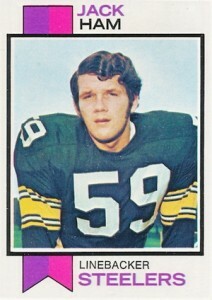 Lambert's rookie in 1976 Topps is the top overall option in the set outside of Walter Payton's rookie card. 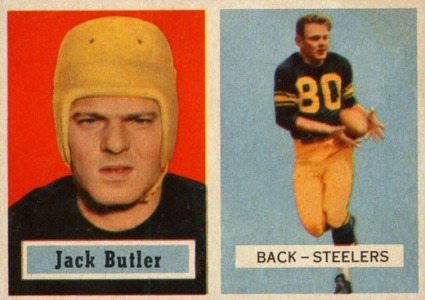 A key part of the Steelers secondary in the 1950s, Jack Butler was a four-time Pro Bowl selection and inducted into the Hall of Fame. Collectors can find his rookie in 1957 Topps, one of the most loaded sets for rookie HOF collectors and popular for its dual-image design. Although he really only played five seasons in Pittsburgh, John Henry Johnson was a top rusher in the early-1960s and named to three Pro Bowls with the Steelers. One of the earliest rookie cards on the list, Johnson's first card is found in 1955 Bowman. Synonymous with the suffocating Pittsburgh defense, "Mean Joe" Greene is one of the greatest defensive lineman in NFL history. He was selected to 11 Pro Bowls and was a two-time NFL Defensive Player of the Year. Card value puts his 1971 Topps rookie in the fourth spot, but based on relevance, Greene could easily be first and his jersey number is one of only two to ever be officially retired by Pittsburgh. 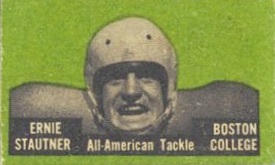 The first player to have his number retired by the Pittsburgh Steelers, Ernie Stautner was nine-time Pro Bowl selection during his Hall of Fame career. While there is still uncertainty about the actual year his rookie card was released, collectors can find the undersized card in the Topps Felt Backs set, which remains in limited supply. Stautner's 1951 Bowman card is also a popular early option. 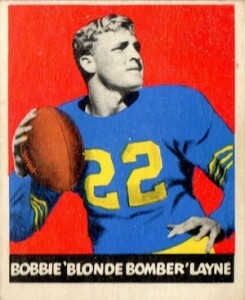 More remembered for his time in Detroit, Bobby Layne spent the end of his Hall of Fame career with Pittsburgh. Layne was one of the top quarterbacks of the 1950s and his rookie is part of the vivid 1948 Leaf set. Collectors will notice that his first name is misspelled on the card. 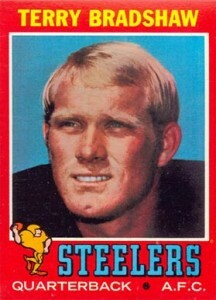 One of the most successful quarterbacks in NFL history, Terry Bradshaw went to three Pro Bowls and was named the Super Bowl MVP twice. 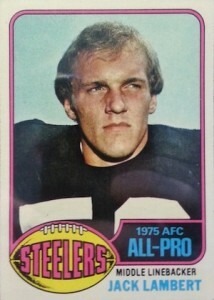 His 1971 Topps rookie is one of the most popular and valuable rookie cards in football collecting. Although the elite modern options aren't as revered as the vintage Pittsburgh Steelers rookie cards, collectors can still find many good options in the group and several Hall of Fame players. Given the vast changes that took place in the collecting world from the 1980s to the 2000s, the rank is more based on overall relevance versus card value. Yes, even kickers matter to some collectors. Gary Anderson had a long career with many teams, but he was a Steeler for most of the 1980s and one of the best in the league. His 1983 Topps rookie is cheap and not hard to find. A dominant modern linebacker for the Steelers, James Harrison went to five Pro Bowls before leaving Pittsburgh for Cincinnati and then retiring. He has since resumed his career with the Steelers. Harrison has several base rookies in 2008 products, but his top option is found in Exquisite and is limited to just 75 copies. 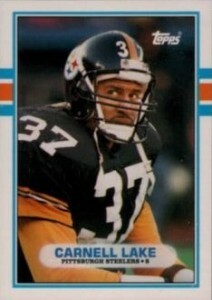 Carnell Lake was an elite cornerback for the Steelers in the 1990s and and a five-time Pro Bowl player. His 1989 Topps Traded rookie is very inexpensive and he also has a rookie card in 1989 Pro Set. Nicknamed "Big Snack," Casey Hampton was a five-time Pro Bowl selection for the Steelers. Hampton has multiple rookie cards available, but his Bowman Chrome card is arguably the best. 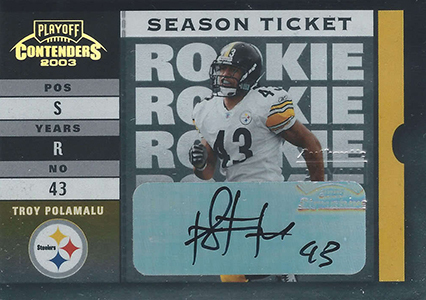 A game-changing player on defense for many years, Troy Polamalu is a fan favorite for the Steelers. Polamalu has been named to eight Pro Bowl teams and Defensive Player of the Year in 2010. With nearly 20 rookie cards to pick from, collectors have shown a preference for his signed Contenders card. A consistent producer and safety valve for Ben Roethlisberger, Heath Miller is the unsung hero of the Steelers offense. 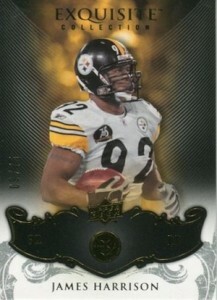 While it is easy to get overwhelmed by the 40+ rookie cards for Heath Miller, the top card is found in 2005 Exquisite. 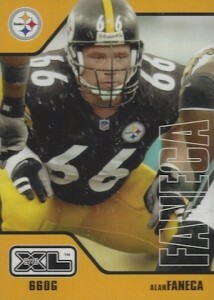 Offensive lineman don't get normally a ton of recognition but Alan Faneca was a seven-time Pro Bowl guard for the Steelers and one of the best in their team history. His rookie release is a modern rarity because there is only one option available and it is found in 2002 Upper Deck XL. The all-time leader for receptions, receiving yards and receiving touchdowns with the Steelers, Hines Ward was a four-time Pro Bowl selection and the Super Bowl XL MVP. 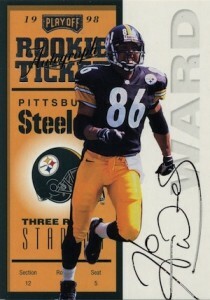 He also has a large quantity of rookie cards to pick from, but most collectors prefer his Rookie Ticket in Contenders. Although it is not numbered, the print run was revealed to be 500. 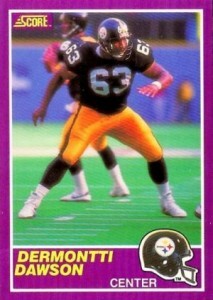 The successor to Mike Webster, Dermontti Dawson continued the tradition of dominance at the center position for the Steelers and was selected to seven Pro Bowls. His most popular rookie is found in the factory update to 1989 Score, but the Hall of Fame player also has a rookie card in 1989 Pro Set. 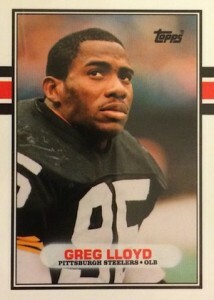 Greg Lloyd was one of the best defensive players in the in NFL during his time in Pittsburgh, appearing in five Pro Bowls. He only has one rookie card option and it comes in the update set for 1989 Topps. As the face of the franchise for the last decade, the success of the Pittsburgh Steelers has gone hand-in-hand with the health and productivity of Ben Roethlisberger. 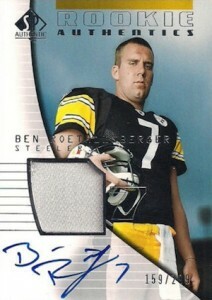 "Big Ben" has led the Steelers to two Super Bowl titles and is one of the top options for fans and collectors. There are plenty of rookie cards for Roethlisberger, including several signed cards, but his SP Authentic card is arguably the best. Jerome Bettis spent several seasons with the Rams before making the move to Pittsburgh, but his legacy with the Steelers is firmly in place. A bruising running back, "The Bus" went to four Pro Bowls as a Steeler and helped them win their first Super Bowl in 25 years. 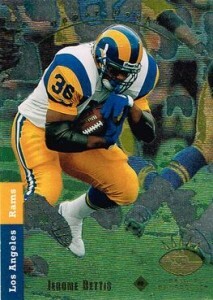 With over 20 options, collectors should look to 1993 SP for the best Jerome Bettis rookie card. 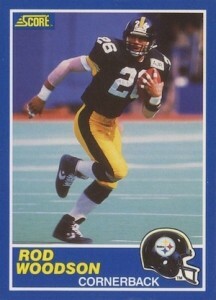 Although he put forth several elite seasons with other teams, Rod Woodson will always be remembered as a Steeler. The Hall of Fame defensive back went to seven Pro Bowls with Pittsburgh and was the Defensive Player of the Year in 1993. 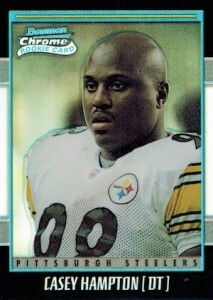 One of three options, his top rookie card can be found in 1989 Score and is a top card for any Steelers fans. JSE Gem Mint 10 Steelers RC James Washington Auto 2018 Leaf Flash 6 10 RARE!!! 2010 Antonio Brown Contenders Rookie Auto BGS 10 10 Steelers Rare!